Ueberlingen, a town (1959 pop. ca. 8,000; 2005 pop. 21,417) in Baden-Württemberg, Germany (coordinates: 47° 46′ 0″ N, 9° 9′ 30″ E), located on the north shore of Lake Constance, is the seat of a Mennonite congregation founded ca. 1840. The baptized membership in 1957 was 62, with Ludwig Moser as elder (since 1943). Bender, Harold S. "Ueberlingen (Baden-Württemberg, Germany)." Global Anabaptist Mennonite Encyclopedia Online. 1959. Web. 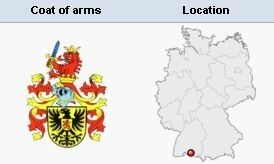 19 Apr 2019. http://gameo.org/index.php?title=Ueberlingen_(Baden-W%C3%BCrttemberg,_Germany)&oldid=113980. Bender, Harold S. (1959). Ueberlingen (Baden-Württemberg, Germany). Global Anabaptist Mennonite Encyclopedia Online. Retrieved 19 April 2019, from http://gameo.org/index.php?title=Ueberlingen_(Baden-W%C3%BCrttemberg,_Germany)&oldid=113980. This page was last modified on 21 February 2014, at 08:37.